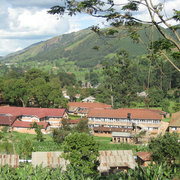 Kisizii Hospital is a hospital located in rural south-western Uganda. It's an area where the already fragile public healthcare system of the country struggles to cope with the burden that many families in the area must face. The hospital, now close to sixty years old, attempts to fill that hole and provided vital life saving medical care to those who need it most.I will be going out there as a student leader in a multidisciplinary team of healthcare students this July. While there we'll be studying and learning more about how healthcare works in tropical and developing countries, while also lending our own skills to helping with some of the challenges the hospital and surrounding community faces. Some of the ways we'll be helping out include running a Cerebral Palsy camp for children with disabilities in the area-providing them with exercises and management to help deal with their conditions, providing first aid workshops and assisting in the day to day activities of the hospital. The funds you donate will go towards enabling us to travel and work there, and also to funding those programmes-providing critical education and support to help try and break the stigma of disability and redress some of the scars which poverty has left on the community. Best of luck Cian on the adventure - great cause.